Julie wanted to go to Germany to see her relatives, including 91-year-old Samuel the brother of her maternal grandfather. As a bribe to get me to go she suggested a bike tour along the Danube River while we were there. I resisted as it was not a good time to go for a number of personal economic reasons and that the Euro cost $1.45. But I am always up for a bike tour with my wife! Julies grandfather came to America from Germany in 1929, following his future wife. He left behind 3 brothers that were subjected to a new governing party. He nearly returned due to his difficulty in finding work following the stock market crash and ensuing Depression. You will hear more on tales from the old country later in this article. We arrived in Germany on May 18th. I immediately knew I was in Europe at the Stuttgart airport when I heard the ambulance siren. It sounded like a movie based in a European capitol, only without an explosion. Walter, Julies 70-year-old cousin, picked us up at the airport for our visit to Southern Germany. He lives in Leingarten, a town of about 10,000. We all took a 2-hour bike ride shortly after arrival to his house. Within a kilometer from his home we were riding on paved and unpaved bike trails through farms of wheat, grapes, potatoes and corn. In addition, the trails took us through a forest also close to town. We returned to his home on roads marked 30 KM/H (18 mph). I like this town. Julie was in charge of planning this trip, her first time. That first night upon arrival I realized that other than picking a general destination, the Danube (Donau in Germany) River, there was no plan. On the day after arrival, Julie and I did a day ride to familiarize us with the bike trail system. I purchased a map of Southern Germany to get an overview of where we were riding. The next day we left for an overnight 130-mile ride to the city of Heidelberg and its famous castle with a regional bike trail map that Walter had. I soon realized that given the German bike trail system, planning a trip would be easy with the regional maps that Walter provided me. So within a few hours I, with Julie and Walters input, put together a bike tour. After a day of visiting Samuel, we embarked on what turned out to be a 12-day, 790-mile tour. Germany is 357,000 sq. Kilometers or 137,800 sq. miles, 10,000 square miles smaller than Montana. (Utah is 85,000 sq. miles) It has a population over 82 million. Germany has 16 states. We did our tour primarily in the first and third largest states, Bavaria and Baden-Wurrtenberg located in the very south of Germany. Germany has 230,000 km of roads. There is 50,000 km of signed bike trails in Germany according to http://bicyclegermany.com/bicycling_in_germany.htm. 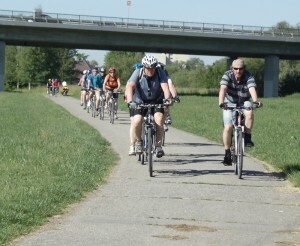 At www.germany.travel/en/erholung/radfahren/radfahren.html 200 long distance bike trails totaling 70,000 km are listed. (you can also get walking trails through this site by clicking on walking). However, a couple of he trails we rode are not listed on these websites, so I assume that Germany has more than 70,000 km. of bike trails. In German a bicycle is a radfahren, or just rad for bike or cycle. A radweg is a cycle track. The radweg system in Germany appears to have a 3-level system. Each town has a radweg system made up of small green signs (red in one region) with a bicycle and a directional arrow getting you through town. These sign are supplemented with regional signs that will get you to adjacent and sometimes distant cities up to 30 km. away. These regional signs look like a street signs with the name of the city, a directional arrow and sometimes the kilometers to that destination. In addition there are named bike trails, many with their own maps, taking you from one region to another. These trails have a special square sign under the regional signs. For example the Donau River trail has a blue, green, and yellow sign. There may be 4 named trail signs attached together under the regional sign. When following a bike trail you will encounter all of these signs as you make your way across Germany so that a city sign may be part of a long-distance named trail. Also a city style bike sign may be in the countryside. You do need a map, but by following the signs, consulting a map and with a little sense of direction, you can traverse the country. In the small cities, the bike trails follow city streets, usually with 30 KPM speed limits. In some cases it seems that you are riding in small alleyways in someones back yard. In some of the larger cities you will ride along cycle paths (specific for bikes and pedestrians), low speed roads, cobble-stoned roads, and in town squares (market places) where the amount of foot traffic may require one to walk their bike. In both large and small cities, the bikeway may be on a widened sidewalk with sections specific to bikes and another section for pedestrians. Sometimes we found riding on the road was less rough and faster than the sidewalks. Sometimes the sidewalks were the nicer option. Outside of the cities one will primarily be riding on narrow paved and unpaved roads. These mainly serve farm vehicles and an occasional car on the paved sections. They are wide enough for 3 cyclists to ride tightly together. The unpaved sections are generally packed gravel with occasional loose gravel, may have small stones or have a bumpy uneven surface. We were surprised by the amount of dirt trails (maybe 25% of our travels) but Julie did well even with one 700 X 28C tire. Despite some of the rough sections, the dirt trails were less rough than the cobbled streets in the older cities. You will find yourself riding from town to town through farms and forests. If you ride on the roads you will find traffic to be sparse, but fast. You will rarely travel more than 6 kilometers between towns. Many of the trails have numerous benches and picnic tables. Around lunchtime it was hard to find an empty picnic table do to heavy use. 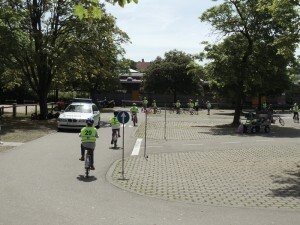 Overall the Radweg system is very, very good. However it is not perfect. In general, you will not travel more than a kilometer without a sign. Sometimes when the trail goes straight, which isnt too often, you may go a few kilometers without a sign, though this is unusual. A few times the bike trail was just begging for a sign. Sometimes the signs were confusing. For example you may be on a road that divides with both roads curving to the left. The bike sign points to the space between the 2 roads. In this case one must travel on one road, then turn around to see if there is a sign on the road from the other direction. On 3 occasions the road split and curved left. There was a sign on the right side with an arrow directing you to turn left. However this sign meant of the 2 roads that curve to the left, take the road to the right! Signs may be on the right side or the left side of the road or just not positioned where one would expect. In one case a sign was blocked by a truck, another time we missed a turn as the sign was attached to a tree with overgrown branches. Rarely did we get more than a kilometer or 2 off course but you do have to pay attention to all of the turns. We somehow lost the trail we were following a few times during our travels, though usually not a problem. With the maps we were able to travel to the next town and get back on the trail. Overall I would give the system an A, or an A+. Cars outnumber bikes in Germany, but not by much relative to America. Germans seem to like riding bikes. I believe the reasons for the popularity of cycling in Germany is attitude and cultural. In addition, Germany is mostly flat, and the flatter the terrain the more cyclists. We rarely saw many cyclists in the hillier areas. People loved being out. The bike trails were packed with people. Seriously, hundreds of cyclists and walkers took to the radwegs. 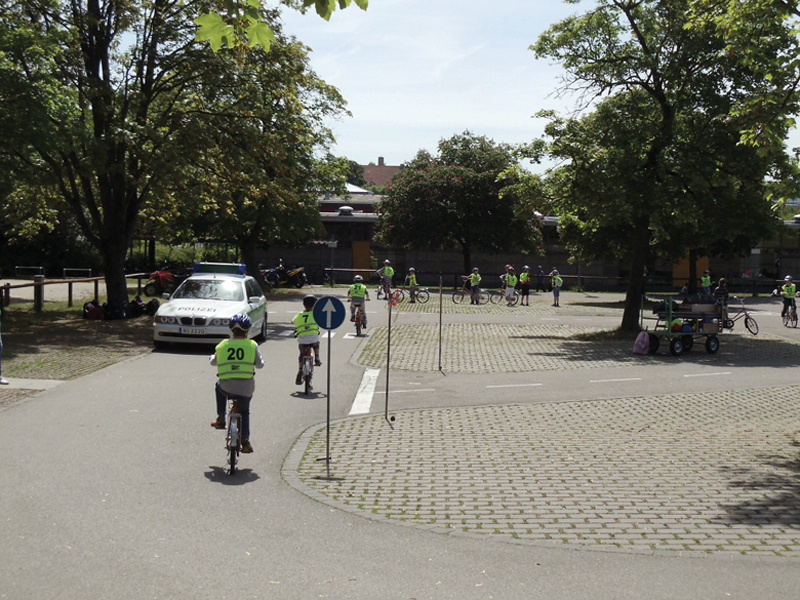 Outside of Heidelberg, we jumped onto the road as we were going at a pedestrian speed of 4 miles/hour due to the number of people walking, pushing strollers or riding their bikes. They were old, young, families, groups of women, groups of men, groups of men and women riding the trails. There was one group of 12 that I thought had escaped from an assisted living facility. The number of 70-year-old riders and perhaps 80-year-olds was amazing. Kids as young as 5 cruising with their parents. Some riders looked like they were more at home on a bar stool than a bike seat, or perhaps more comfortable baking pies. One woman we met was traveling about 50 kms/day to different guesthouses and another couple we met was doing a 60 km (round-trip) ride to attend a festival in the town we were passing through. Traveling by bike was just as normal as driving a car in America. The Germans mostly rode on heavy steel bikes with racks, fenders, dynamo hub light systems and panniers. (Lights are legally required) Tires are 1 inch with a mix of 700C and 26 inch wheels. They use flat bars and flat pedals without clips. A number wear lycra, but most dont. Many had what appeared to be a small set of Samsonite luggage for panniers (made by Vaude, Jandd, Ortlieb) traveling to a guesthouse though I suppose many just ride with their panniers attached. The bike shops are primarily stocked with these bikes. Cafs, supermarkets, etc. have their ample bike racks packed with bikes. Julie and I were the only bike travelers with drop-style handlebars and only a handful of cyclists with clipless pedals. We werent out of place but certainly in the minority. Due to hills and the daily distance we ride, I will stick with my current touring set-up. Julie does better with drop-style bars because of her carpal tunnel issue. Julie and I used a map of Southern Germany to plan our overall tour (www.falk.de). We used a series of 15 regional maps of Southern Germany (borrowed from Walter) for more detailed planning. (Radfaren in Deutschland; www.serges.de). These regional maps helped us follow several regional trails and helped us when we traveled from city to city on roads the maps designated as low-volume vehicle roads. 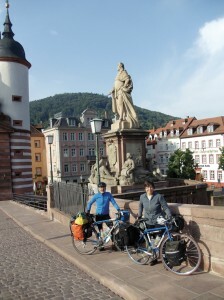 In addition we used a regional map from www.lv-bw.de., for our overnight ride to Heidelberg. Primarily we used very detailed maps for the Altmuhltal Radweg from www.Kompass.at., and for the Donau radweg we used a map from www.publicpress.de. These detailed maps are similar to maps from the Adventure Cycling Association showing clearly all of the twists and turns of the bike trail. The maps from public press are laminated to make them water proof and tear resistant. The entire 590 km. Donau bike trail was on one map at a cost of about 9 Euros. The above bike maps can be found at bike shops, bookstores, information centers, and camping stores plus small spiral bound books of maps. This was our first trip utilizing electronic aides. Julie brought her I-Pad along. On the last day of our trip I found some roads on our regional map in order to avoid hills. Unfortunately many of these roads were unmarked dirt trails. We used her I-Pad to help us get from point A to point B. (We needed a special chip for Germany that we borrowed from Walter). Due to our checking of the I-pad, it was a slow day. We did 35 miles in 3 hours in the morning then, using the I-pad, 3.5 hours to do the next 20 miles. One day we received assistance from Trike-man. Trike-man had a 3-wheeled recumbent. He apparently had a map down-loaded on a small Garmin-like computer mounted on his bike. Julie and I had stopped to look at a map due to confusion on the trail. Then along came Trike-man. We would call out a city and he would point in a direction and wave to follow him. We would then pull ahead only to repeat this scene 2 more times. Another day we met a German also confused by a trail sign. He said to follow him for he had a map on his mobile phone. We did follow him for a couple of kilometers only to fail to see trail signs. So we returned to where we first met him and within a few minutes found the correct trail marker. We have no idea where he ended up. Perhaps we will use more computers on future trips, but basic maps will still be needed. There is a reason why there are few German restaurants in America (with Wisconsin having most of them). I give my apologies to the readers of German heritage but the food is bad! In restaurants, I had little idea what Julie ordered for me 100% of the time and I wasnt sure what I had eaten 50% of the time. Restaurants served overcooked meat with French fries (pomme frites) or bland noodles. Prices were about 8-13 Euros for a meal; cheaper meals were composed of hot dog meat disguised to look tasty. Once, a caf had a few Italian items on the menu. I finally knew what I ordered, but it too was overcooked. I finally found the best meal in Germany. About halfway through our trip, as we were leaving the market square of the large city of Ulm, a man sat down near me. He was eating what smelled liked and looked like a Philly cheesesteak, except in Pita bread. I needed one of these but I didnt want to ask him in mid-bite. On the second to last day of our trip, we were at a stop-light in the city of Nagold. There, across the street was a Pizza and Kabop house with a picture of the cheesesteak in the window. We hadnt eaten much for the past 6 hours so we hustled across the street. Filled with finely sliced lamb, cabbage and onion, the donor kebop was wonderful and filling, and at 3.5 Euros a bargain. These Turkish pizza and kebop shops are all over Germany. Julie and I like to camp. There were plenty of campgrounds along the river trails and lakes. As a tent camper, you receive a piece of ground for your tent. Unlike American campgrounds, no picnic tables were provided except for one campground. Most campgrounds have a caf or beer garden near the campground, so we sometimes would just help ourselves to a table to eat our meals. Generally the price for camping was 5-8 Euros per person. The showers and restrooms were large and clean. At one campground that was a part of a farm, Julie had to walk through the mens shower/toilet area to get to the womens area while I stood guard. Showers sometimes cost a Euro. Could one stealth camp? If one has enough water the answer is yes given the amount of forests that we traveled through. We stayed in 2 hotels (62 and 88 Euros) and one pension (72 Euros). The hotels have rather small rooms though the pension was roomier and had a kitchenette. A substantial continental breakfast was provided but dont expect your standard American breakfast. Our plans and route primarily followed the Donau River (Danube) that has it start in Donaueschingen in Germany, and ends at the Black Sea. We did about 450 km. of the 590 kms of the trail within Germany. The Danube in its entirety is 2850 km or 1771 miles. It is formed ifrom the joining of the Brigach and Breg rivers. 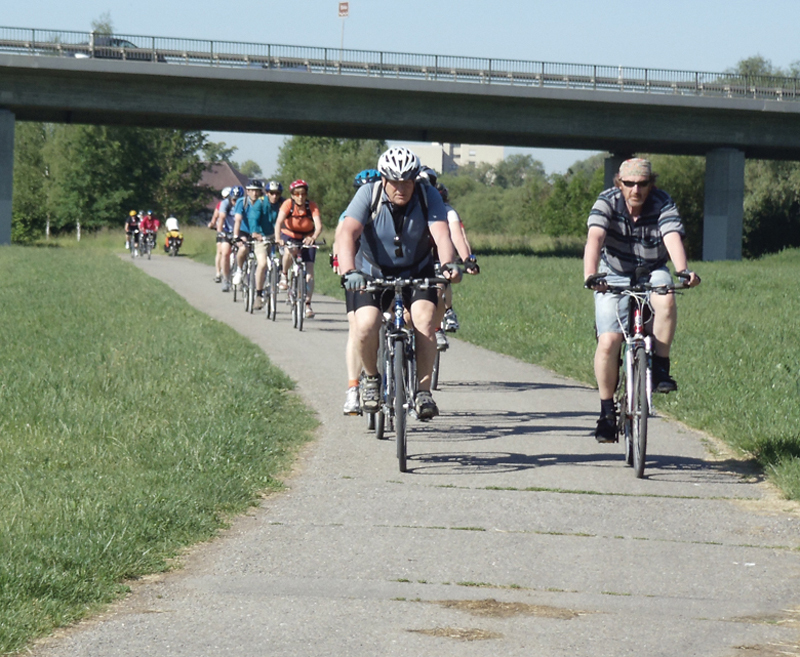 Here is what John Higginson has to say about the Donau trail in The Danube Cycle Way Guide. We started our trip in Rothenberg, about an hours drive from Walters house. Rothenberg is an old city, the center of the city enclosed in an old castle. It also has a Christmas store that sells ornaments and gifts year round. Julie is not a shopper, but she was there for an hour, enjoying herself. We also visited an old church, the inside of which a 3-story building could fit into. We finally left Rothenberg around noon. 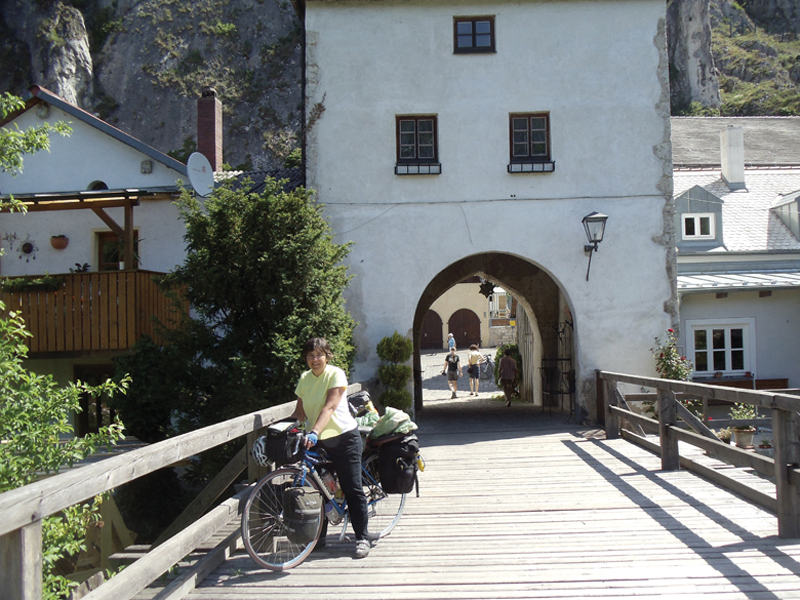 We quickly got on the Altmuhltal radweg, riding the 200 km to the end in Kelheim at noon on Day 3. We completed this day by riding to Regensberg and camping at a canoeing club. From here we continued east on the Donau trail to Straubing. We decided not to travel into Austria so at Straubing we looped back to Kelheim (day 4) to travel west on the Donau trail to Tuttlingen on day 9. We then picked up the Hohenzollern trail to the Bodensee (a large lake separating Switzerland and Germany, also called Lake Constance). We then returned to Walters house primarily on the Heildelberg-Schwarzwald-Bodensee trail. In total we rode on 6 named bike trails. We rode along the Altmuhtal, Donau (Danube), Necker and Nagold rivers that made our travels flat with an exception for some short climbs along the Nagold. Our only major climb of the trip was leaving the town of Tuttlingen where we faced more than a few miles of unrelenting and steep (8-12%) climbing. Julie does well and our bikes are geared with very low gears, but she walked the last 400 meters. As I mentioned, Julies grandfather had 3 brothers left behind in Germany. Walters father died in the war. Another brother was a prisoner of war and has since deceased. Samuel is the only survivor of that generation. He fought on the Russian front. Not only did he survive that, he survived a Russian prisoner of war camp. His health was so poor he (miraculously) was admitted to a Russian hospital. He was treated by a Russian physician who ironically was Jewish. The Jewish doctor noted that Samuel was a common Jewish name at that time, so he assumed that Samuels family was not anti-Semitic. Samuel was sent back to Germany after the war. He walked to his home for the final 200 + kilometers. Due to his state of starvation he was again admitted to a hospital. Learning some German history made the trip more interesting. From European terrorist nation 75 years ago, Germany has one of the most bike friendly environments today. It is also the third largest economy in the world. Despite my initial reluctance to bike tour in Germany, Im glad I went. Yes, it was expensive, but my advice would be to do it. Julie had a great time. I had a good time too, though I will limit my restaurant eating in the future. Given the cycling environment, I could move there. Riding the entire Danube (Donau) river or at least the 838 miles described by the Danube River Cycle Guide, is now on my to-do list. I can understand why going with a commercial bike touring company would be attractive to someone traveling to Europe. Experienced guides would help with the language, traffic signs, and route selection. If you are unlike me and like to be a tourist, a guide will take you to interesting destinations. We didn't know that there was a museum of torture in Rothenberg, though I don't know if I would have gone had I known about it. Perhaps when I am too old to carry my gear Ill pay a commercial company. I was told by several of my European bike visitors that many people speak English and I wouldnt need to learn German. This was a mistake. Outside of the larger cities few speak English. Take a conversational German course! Fortunately Julie speaks very passable German. If you ask directions, expect a lengthy reply such as go straight for 3 blocks and make a right after the railroads tracks. When you cross the bridge, go left for half kilometer (in German of course). So practice what will be common bike conversations in addition to basic conversational German. Food stores are plentiful such as bakeries, cafes, and small supermarkets in nearly every town so you do not need to carry much food. However, except in larger cities they will be closed on Sundays and they were closed on a German holiday that we were not aware of. The bakeries are good though the pastry and bread are a little dry. The supermarkets are small but will serve your needs. If you eat peanut butter or tuna for lunch, bring your own. Neither was sold in the supermarkets and nor was decent jam. Germany doesnt have convenience stores for you to stop in when nature calls. In the larger cities you will find information offices for tourists, where you may obtain free regional maps. There usually will be a public restroom nearby designated with the initials WC, for water closet. Otherwise bakery/cafes will provide you with toilet facilities. For half a Euro you can buy a bread-like soft pretzel in return for use of the restroom. We did our tour(s) from May 20 to June 4th. We hit a dry spell, very dry for Germany. We had 1 days of rain, and it rained on two additional nights. Expect and be prepared for rain. My youngest sons girlfriend was a nanny in Germany. She said it rained every day one summer. The weather was also hotter than expected, though except for one day in the high 80s, we rode mostly in 70-degree temperatures. Germany doesnt have Laundromats though Walter said there might be some in the larger cities. Less than half of the campgrounds had washing/dryer machines. Because of the humidity and rain, our hand washed clothes didnt always dry by the next day. Be aware and prepared. Fortunately we tend to over pack clothing for riding and off-bike use. Traffic signs in Germany are different. Learn German traffic signs. Google German traffic laws and signs. In general, traffic signals are rare in smaller towns. In larger cities you will encounter pedestrian/bicycle traffic lights. Instead of traffic lights, you will see a white triangle with a red border that is used to stop traffic but it is treated like a yield sign. The Yellow light comes before the Green light, not Red. There will also be signs telling you to walk your bike (in German of course) in some situations such as a pedestrian-crowded narrow street. Im sure Julie and I committed some errors of courtesy on our trip. (Julie thinks she was flipped off by one driver.) Overall it seems that pedestrians rule the transit system in Germany with bikes close behind. Many times an oncoming car would stop to allow us to make a left hand turn! Germany is not smoke-free. Except for the state of Bavaria, there is a lot of political resistance to smoke-free restaurants. So if you want that fresh air ambiance at an outdoor cafe choose your seat wisely because you may be surrounded by smoke.